I’ve received a couple of e-mails over the past ten days: am I well? Is everything all right? (These from fellow bloggers whose blogs I frequent). I had to tell them: I was travelling and the net connection was somewhat dodgy. Besides, I was very busy. I often got only about half an hour to check my e-mail and catch up with what was going on at my blog. To explain: I was at a writer’s conclave. The JSW Group, in partnership with The Hindu, played host to nine writers, including yours truly, for ten days, for a conclave named The Spaces Between Words. 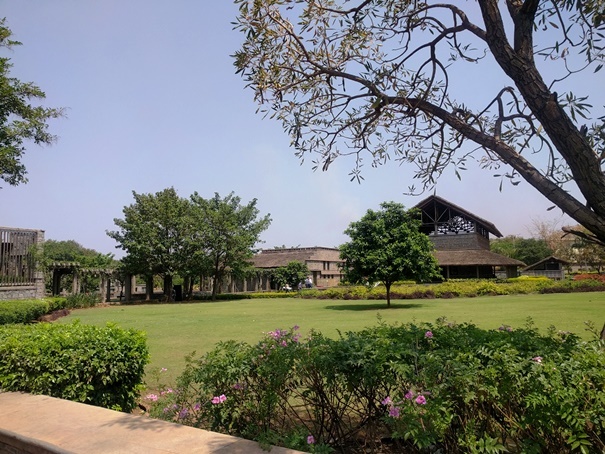 We stayed at JSW’s very own guest house, Hampi House, at Vidyanagar, one of the townships that JSW has built around its steel plant in Karnataka’s Bellary district. Most of our writing was done at the nearby Kaladham, a lovely space just five minutes’ leisurely stroll from Hampi House.